We will be holding our AGM on Tuesday 18th July at the The Black Horse, starting at 6.30pm. The normal Otley Chamber of Trade meeting will follow at 7.30pm. So that we are aware of numbers and know how many copies of the 2016/17 Accounts to print, we would be grateful if you could RSVP by email to steph.lee@otleybid.co.uk. 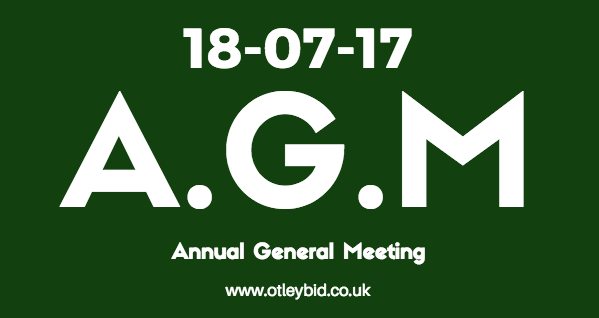 Latest 2017 AGM, Annual General Meeting, Otley BID. permalink.